Arrowhead Alpines Blog: Flowers without forcing? I potted up some daffodils and hyacinths a week or so ago, and popped them in the fridge to get their requisite cold period so I could pull them out and have lovely, fragrant flowers come February. I can never remember just how long they need to be in there, so (of course) I went to google, and up popped a website giving me the information I needed -- about 12 weeks of cold. But then I read down farther and saw they stated that Iris reticulata and Scilla require no cold period to flower. Wait -- what? 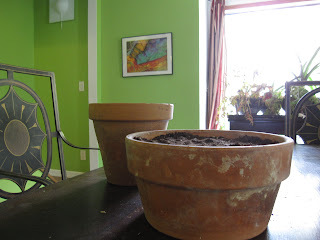 You can just pop them in a pot like paperwhites and they'll flower? I looked for confirmation and found this fact sheet from University of Rhode Island confirming that Iris reticulata needs no cold period. Haven't been able to confirm the Scilla -- this page from the University of Wisconsian says they need 6 weeks of cold, and I'm inclined to believe them. Perhaps the first page was refering to the tropical Scilla peruviana. So now I'm going to have to try it -- incase you've never grown it, Iris reticulata is one of the loveliest bulbs in the universe (as you can see in this photo I nabbed from wikipedia) -- Tiny, intricate, delicate blooms with a light fragrance... I've long considered them as essential as crocus for the early spring garden... but if I can just pop some in a pot and have them flowering all winter... Time to make yet another run out to buy bulbs. 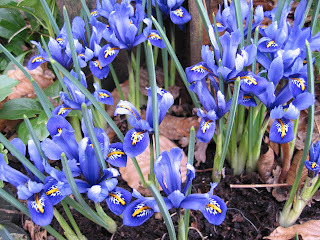 I didn't know that about iris reticulata, only that they were never overly happy in my garden. Snakeshead iris has thrived. I might try forcing some I.reticulata. They would be as pretty for Valentine's as for Christmas, so it isn't too late to get some bulbs in the November sales. I. reticulate isn't reliably perennial for me either, but it is so lovely, (and so inexpensive) that I'm happy to plant more of it each year.